The month of February brings the arrival of Chinese New Year with it! This holiday is traditionally celebrated over the span of several days, and includes festivities such as parades, dancing, large feasts, gifts, and special clothing. For good luck, dancers where dragon costumes and dance in the streets and at parades. These dragons are believed to be good luck, and are very colorful and vibrant. This year, why not make your own Chinese New Year Hand Dragon craft? Even though Chinese New Year is technically over, this is a fun paper craft for kids to make any time of the year! A Chinese New Year Hand Dragon is simple to make and you can use items you already have around the house. 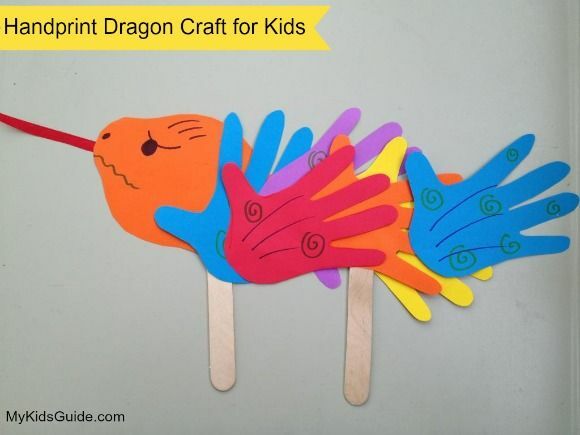 Kids will love not only creating, but the finished product of their very own vibrant paper dragon. Once they’re done making this awesome paper crafts for kids, they can use it to put together their own parade or special dance! Sound fun? Here is how you can make your own Chinese New Year Hand Dragon Paper Craft for kids! First, trace your child’s hand 6-8 times and cut out. If they are old enough, they might be able to trace their own hands. Glue the hands to each other in a line, creating the body of your dragon. You can bend and frill the fingers of each hand if you want to create dimension. Free hand a head and face for your dragon and attach to the front. A simple oval works fine. Glue a craft stick to the head and to the tail of the dragon, so you have a way to hold it and move it. Attach a pipe cleaner or ribbon to the mouth to create fire coming from the dragon’s mouth. That’s it! You can color your dragon further if you wish or just use it as is! Your child can create their own good luck dance with their dragon or even their own parade. Put on some fun music and go to town! Want to enrich this paper craft for kids activity further? You can read the book Dragon Dance by Joan Halub to further enrich this activity. It is all about a Chinese New year adventure and includes lots of new vocabulary and bright and colorful illustrations. Children can lift the flaps and learn about Chinese New Year customs and traditions. Chinese New Year is a fun way to learn about new traditions and enjoy time together as a family. So gather your supplies, gather the kiddos, and create this Chinese New Year Hand Dragon paper craft for kids together. It is simple, inexpensive, and so fun and colorful. So have fun, and as the Chinese say, Gung Hay Fat Choy, or Happy New Year! Oh my gosh! What a cute craft idea! Thanks so much for sharing! I just saw that on TV too. So cute! I would never think of this myself. How very clever! Fabulous craft idea! I know my kids would love to practice tracing and cutting out their hands for this. Thank you for sharing. What a creative craft!! This would be fun for when I babysit my nieces and nephews!! Kelsey Apley recently posted..Ubooly- a fun cuddly creature that teaches kids and plays with them! Cute post! I love it! PINNING!! Kristin Wheeler (Mama Luvs Books) recently posted..Nemo Blizzard 2013 ~ We Survived! Ooh it’s the holiday and I have all those materials! I can entertain my kids! Sure it can cost a lot to get started but if you take care of your equipment they are all 1 time purchases. And the cost savings and health benefits outweigh the cost of buying storebought GMO veggies. Being a hunter I wanted to supplement my meat savings by gardening. I spent a lot of time, and energy, but I have already had 1 crop of radishes, and my tomatoes are about ready to start picking. The asparagus is what I’m most interested in getting. everything is coming along so nicely with no soil amendments.